The holidays are here and that means winter break for the kiddos. What better way to spend quality time as a family than to pack up the car and head out on a road trip to San Luis Obispo? Conveniently located halfway between Los Angeles and San Francisco, SLO is the perfect vacation destination. SLO offers countless adult-friendly events and activities that allow you to bring kids in tow. Check out some of our favorite things to do in SLO that the whole family will enjoy. San Luis Obispo is home to tons of family-friendly restaurants. Choose from one of our many sandwich shops like High Street Deli, have a casual sit-down meal at Firestone Grill or take the fancier approach and treat the fam to some fine dining at Giuseppe’s Cucina Rustica. 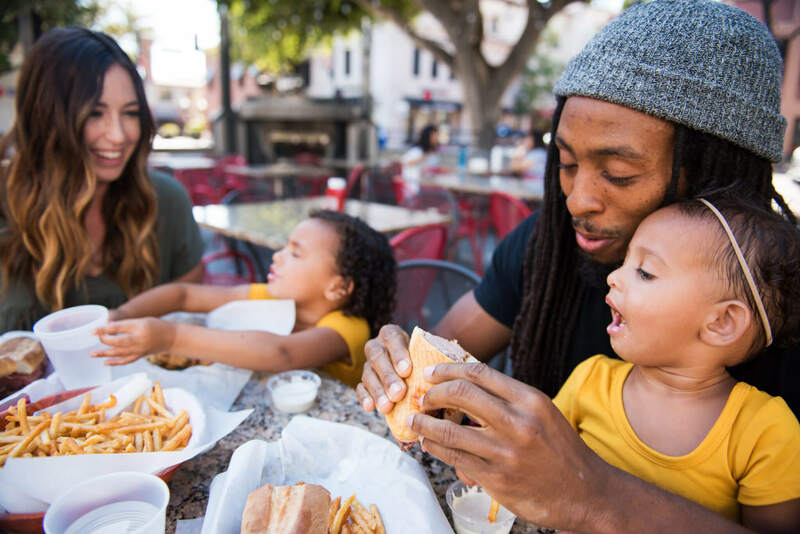 From meals near the creek to easy-going picnics, your family will be sure to leave with happy bellies no matter where you go. If you’re in need of a pick-me-up, there are several local, family-owned coffee shops throughout town that caffeinate the adults and provide the kids with drinks like steamed milk, milkshakes, and hot chocolate. Some of our favorites include Nautical Bean, Scout Coffee, Ascendo Coffee, Kreuzberg, and Sally Loo’s. At the end of the night, grab a sweet treat from an ice cream parlor or a candy store downtown. San Luis Obispo is also home to SLO Donut Company, a 24-hour donut shop notorious for their out-of-the-box donuts that are so fun to look at, you won’t want to eat them! 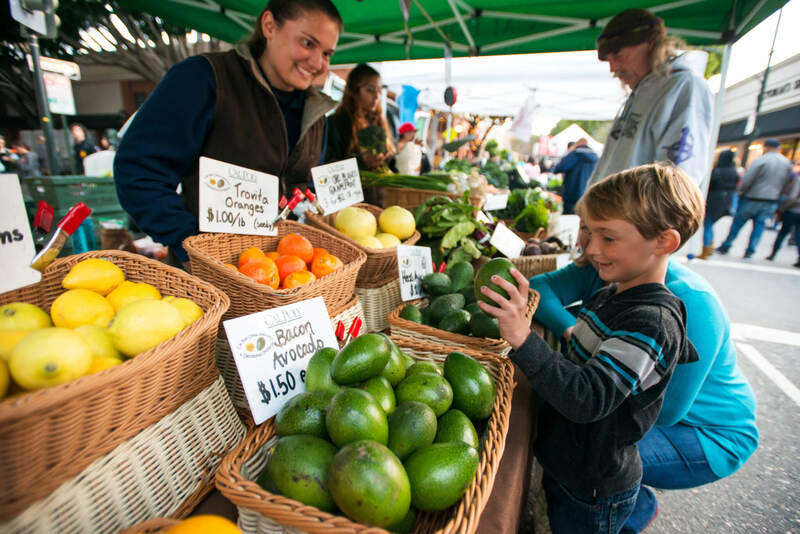 Start or end the day with one of SLO’s many farmers’ markets, where you can grab a bite to eat, purchase fresh produce and listen to live music. See what local vendors have to offer at these popular family-friendly, weekly events. Hop on the Old San Luis Obispo Trolley to make your way from your SLO hotel to Downtown SLO, where there is an abundance of shopping, restaurants, and attractions to explore. 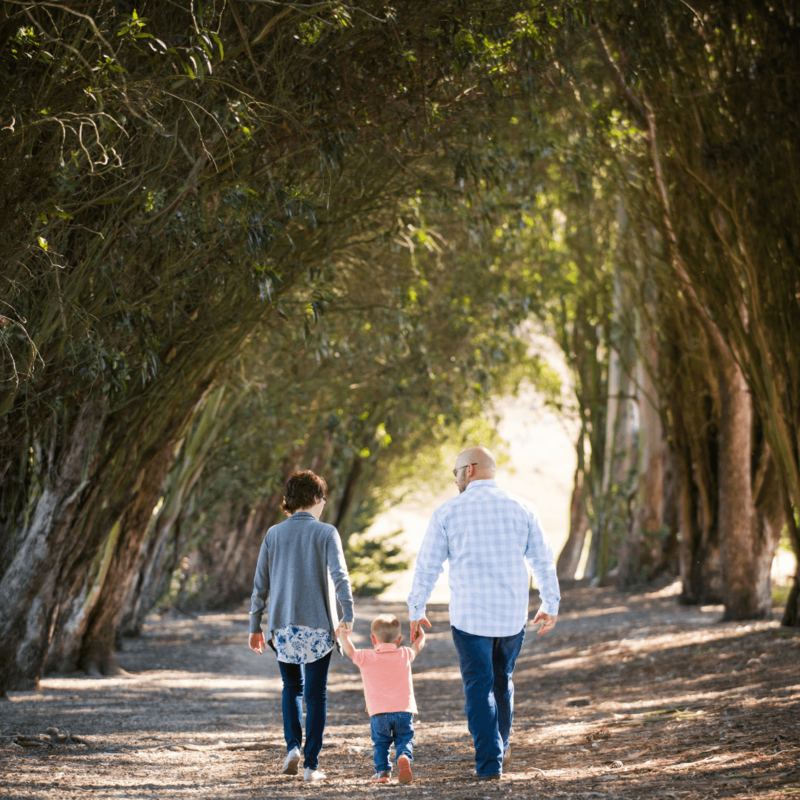 Everyone in the family can leave their mark on Bubblegum Alley, SLO’s iconic gum graffiti wall, or learn a bit about SLO’s rich history by visiting Mission San Luis Obispo de Tolosa, where tours are held every afternoon. The Central Coast has a rich history and is home to one of the world’s most luxurious estates, Hearst Castle. Once home to magazine mogul, William Randolph Hearst, this California State Park offers guided tours throughout the day to show off the estate’s architecture and 1930’s feel. 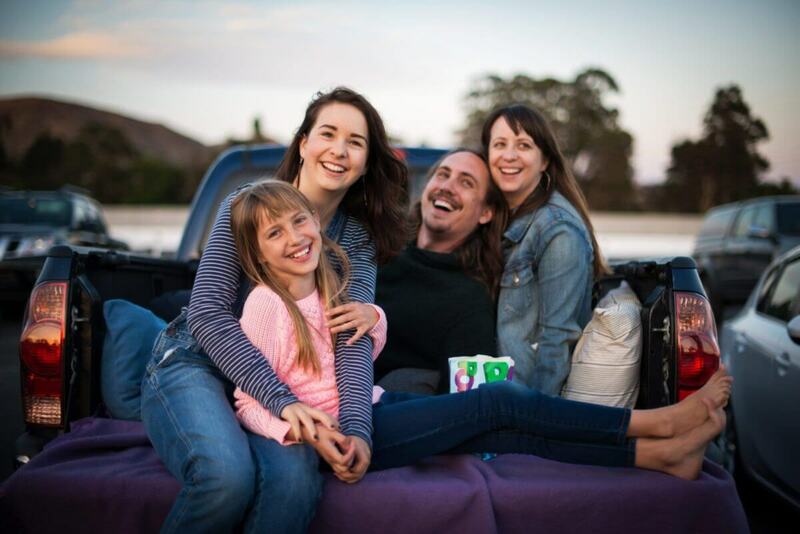 Drive-in movie theaters are rare these days, so while in SLO, be sure to pack the car full of snacks and blankets and watch a movie at Sunset Drive-In. You’ll be able to see that film you’ve been waiting for, and the kids will enjoy an old-school way to watch movies. If you’re looking for a more traditional theater, The Movie Experience: Downtown Centre 7 shows all the latest movies in comfortable recliner seats. SLO is known for its active community, and for good reason—the city is surrounded by mountains which provide countless hikes that range in difficulty and length. This is a good way to let out some energy while seeing panoramic views of SLO and taking advantage of the town’s youthful, outdoorsy vibe. Head into Edna Valley wine country to go wine tasting at local, family-owned vineyards. Many wineries allow the whole family to come along and play games and have a picnic. Taste some of California’s best pinot noirs and chardonnays while the kids attempt to play bocce ball and snack on a cheese board. With an abundance of things to do in SLO, winter road trips don’t have to be a hassle, and they definitely don’t have to be centered around the kids. Here, there’s something for everyone. Book your SLO hotel today and start planning your next family getaway.